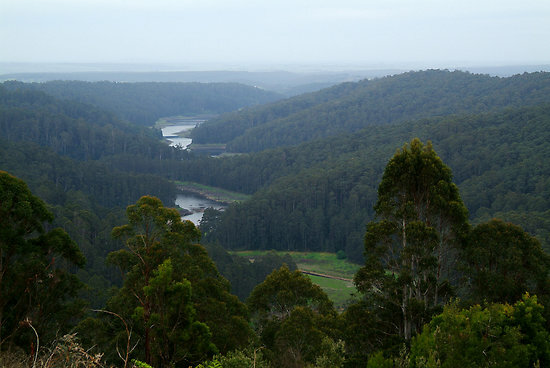 Along the crest of the wettest part of the Otway Range lies a rolling plain with rounded hills and shallow valleys. This area has one of the highest annual rainfalls in Victoria, averaging almost 2000mm at Weeaproinah. 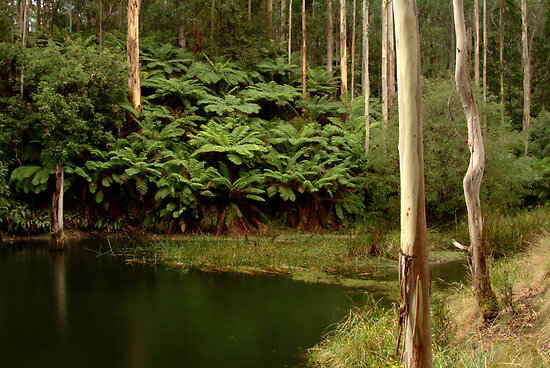 Prior to settlement late last century, tall open forests, Eucalyptus regnans (Mountain Ash) and associated species dominated the landscape, but now most areas have been cleared for agriculture. The perennial nature of many of the creeks and drainage lines gives the area high water catchment values. Conflict also arises between its scenic appeal as a rural landscape and the conversion of farmland to softwood plantations. 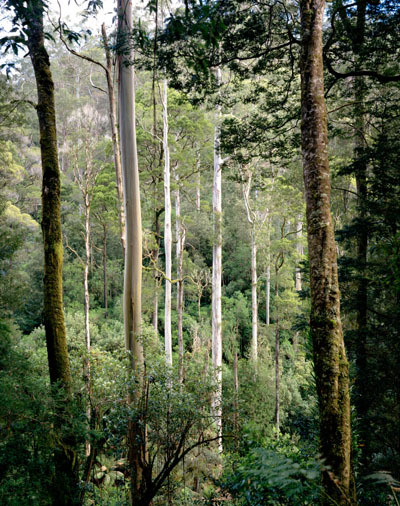 ‘The Otway Ranges support diverse native plant communities ranging from Cool Temperate Rainforest to Heathy Woodlands. 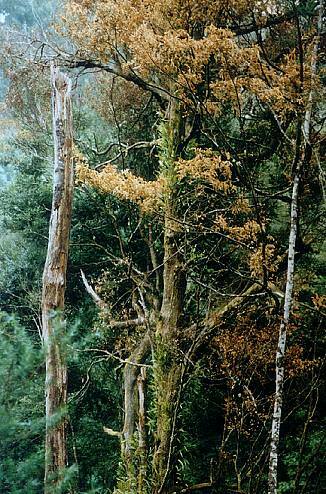 Lunt (1989) described 19 floristic communities (comprising 55 subcommunities) in the Otway FMA. Further work may define other subcommunities. Native vegetation has been mapped into one of nine major communities (refer to Section 6.1). Cool Temperate Rainforest, Heathy Woodland, Wet Heath and Coastal Complex floristic communities within State forest have been zoned for conservation. In State forest, the five floristic communities within the production zone are Wet Sclerophyll Forest, Foothill Forest, Damp Sclerophyll Forest, Grassy Forest and Dry Sclerophyll Forest. Human activity which results in artificially elevated or epidemic levels of Myrtle Wilt within Nothofagus-dominated Cool Temperate Rainforest. 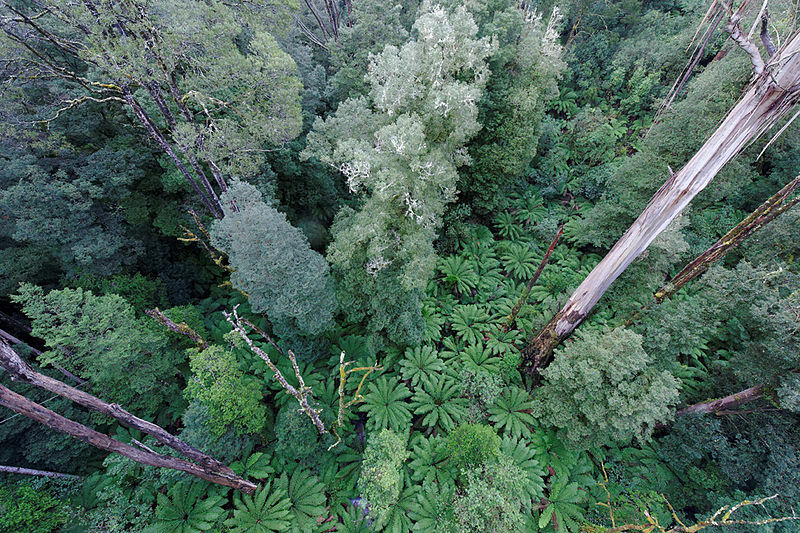 The Otway Ranges includes featured species considered significant due to their known low number or restricted habitats as a consequence of decades of logging and associated habitat fragmentation and destruction. Arguably, we may consider that of the above twenty-seven possible categories of Habitat Threat, the following still remain for the Otway Ranges. The old growth Mountain Ash temperate forests of the Otway Ranges provide a vital but restricted habitat to Australia’s largest forest owls such as the Powerful Owl (Ninox strenua), the Barking Owl (Ninox connivens), the Masked Owl (Tyto novaehollandiae), the Sooty Owl (Tyto tenebricosa) and the Southern Boobook Owl (Ninox novaeseelandiae). These are collectively referred to as the Large Forest Owls. These owls are all forest dwellers, but vary in micro-habitat requirements and general ecology. Owls are monogamous, forming life long pair bonds and are generally sedentary, occupying large permanent home ranges. Each pair of these Large Forest Owls require a permanent territorial home range of up to around 1000ha (1km2) and more if the quality of habitat and density of prey is poor. They each tend to have small population sizes due to low reproduction rates, high juvenile mortality, large home ranges and decreasing areas of habitat. Bushfires and/or non-prescribed bushfire regimes. Long term habitat management approaches should be directed towards maintaining connectivity within and between large patches of forest to link areas of suitable habitat and to ensure the protection of prey by maintaining understorey and ground cover habitat within bushland areas. Support protection and management of bushland containing owl species. 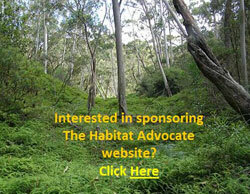 Encourage and plan for tree retention, particularly habitat trees on private land. Revegetation of riparian and creekline habitats, for movement and foraging opportunities. Retain old growth forest, including the ground cover, such as fallen logs to maintain habitat for prey species. Increase community awareness and involvement in owl conservation of the community through local environment network. 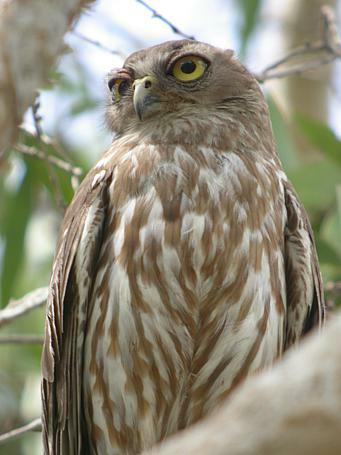 There is a strong relationship between the occurrence of Powerful Owls and their habitat. They are forest dwellers which rely on areas of old growth forests that contain mature, live hollow bearing eucalypt trees that can be hundreds of years old. 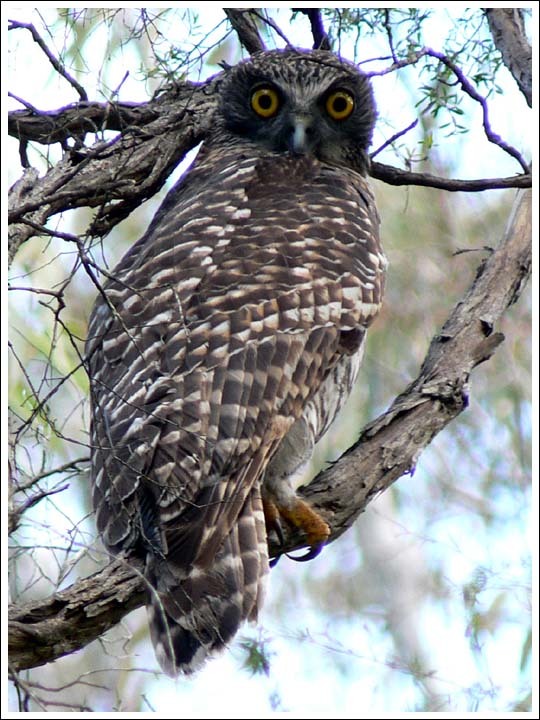 In a study of Powerful Owls near Melbourne, McNabb (1996) found a connection between habitat quality, home range size, diet breadth and breeding success with owls in less productive habitat occurring more sparsely and breeding less successfully on a more generalised diet. Optimum habitat elements for fostering high breeding productivity, include high densities of large, live (old growth 150+ years) hollow bearing trees in sheltered positions and orientations. The Powerful Owl occurs along the south-eastern fringe of mainland Australia from southern Queensland into New South Wales and Victoria. In Victoria it occurs across the eastern highlands extending into south-west Victoria. Most records occur in forested areas, in the south-west records exist in the following biorgeions; Central Victorian Uplands, Goldfields, Greater Grampians, Glenelg Plain, Otway Ranges, Otway Plain and Warrnambool Plain. Powerful Owls may share tracts of forest with Sooty Owls and Masked Owls, but habitat modelling data suggest that Powerful and Sooty Owls have different requirements despite a broad overlap in distribution. Powerful Owls favour the more open forest and broad gullies, with plants such as Blackwood Wattle whilst Sooty Owls favour the wetter sites and rainforest with plants such as Silver Wattle, Blanket-leaf and Tree-ferns (Loyn et al 2002). There is virtually no overlap between diets of Powerful Owl and Masked Owl, as they tend to forage in different places and take different prey. The Powerful Owl hunts for prey that almost exclusively lives in trees and mostly takes prey which is 50-100% of its own body weight whereas the Masked Owl takes smaller prey which is 3-20% of its body weight (Kavanagh 2002). The powerful owl is a generalist hunter, preying on the most available prey at a given site and in a given season (Cooke et al 2006). The main component of the Powerful Owl diet across its range is Ringtail Possum, this may be supplemented by other arboreal possums and gliders depending on the geographic location and prey present, eg Greater Glider, Brushtail Possum, Sugar Glider, Yellow-bellied Glider (Cooke et al 2002). The extent of home range of the Powerful Owl is influenced by habitat quality and subsequently the abundance of prey. 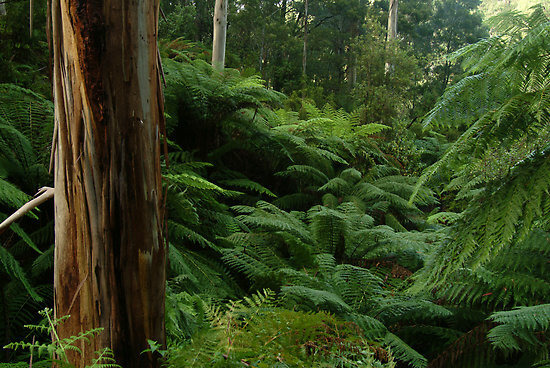 In areas near Ferntree Gully, east of Melbourne where there was good habitat (since destroyed by logging and Melbourne suburban sprawl) and an abundance of Ringtail Possum prey the home range was estimated to be 300ha (McNabb 1996), for areas in the Box-Ironbark forests of Victoria the home range could be from 1380 to 4770ha (Soderquist et al 2002), but it is generally accepted to be about 1,250 ha or within a 2 kilometres radii (Loyne et al 2002). Nest sites are selected high up in old, large living eucalypts (150 + years old). Nest hollows are large and can be about 1metre deep with an entrance nearly .5 m wide (Cooke et al 2002). Owls may sometimes re-use nest sites or select a different hollow every 2-4 years. In Victoria it has been observed that laying takes place late May to a peak mid June with a nestling period 8-9 weeks during which one or two chicks are reared, post fledgling dependence lasts for 6-7 months (McNabb 1996). Creation of new reserve areas such as the expansion of the Great Otway National Park will add security to Powerful Owl habitat. Powerful Owl Management areas (POMAs) have been identified across a variety of Crown land tenure to protect Powerful Owl habitat. For State Forests where clear-fell harvesting is used, areas of suitable habitat of at least 500ha (dependent on habitat type) are protected as SPZ within a 3.5km radius. Where selective harvesting is used, POMAs comprise Special Management Zones of about 1,000 Ha. In existing conservation reserves POMAs contain at least 500ha of continuous suitable habitat. The number of POMAs identified for each forest management area in FFG Action Statement are: Horsham 15, Portland 25, Midlands 25, Otways 15. (DSE 2004) Areas of private land that support Powerful Owls require protection with landholder support and through identification in municipal planning schemes. Specific Actions from the DSE Actions for Biodiversity Conservation database Midlands, Otways, Horsham & Portland Forest Management Areas Undertake owl surveys as part of the West Regional Forest Agreement to improve estimation of population size and the location of breeding population. Monitor at least 10% (ie 50 sites throughout Victoria) of Powerful Owl Management Areas (POMAs) regularly to determine persistence of owls and breeding success. Protect Powerful Owl habitat in State forest according to the prescriptions in the FFG Action Statement. 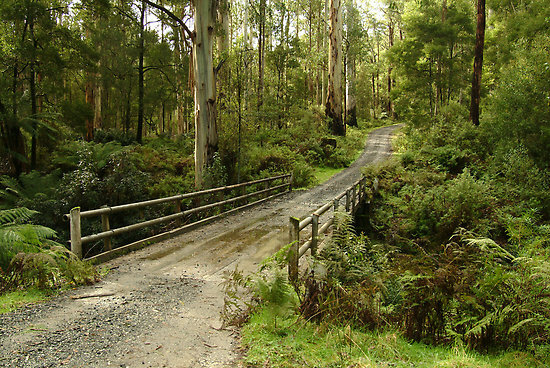 ‘The Cape Otway Centre for Conservation Ecology is an independent, non-profit ecological research and wildlife rehabilitation centre dedicated to the conservation of biodiversity. We achieve this through innovative and effective responses to the challenges and threats that ecosystems and species face. In addition to addressing local and regional conservation needs, much of our research contributes to widespread universal solutions. ‘The Otway Agroforestry Network encourages and supports local farmers to design and implement revegetation projects for the reasons that matter to them. Otway landholders want trees on their farms to shelter stock, control erosion and dryland salinity, attract native birds, enhance property values and, if at all possible, to generate income.